I’m down and out with a cold and cough. I have a cough that sounds like a seal bark and draws a lot of attention. I find it best to stay home because on the bus, people move away from me and people at work ask every five minutes if I’ve gone to see a doctor. To make myself socially acceptable, I feel I have to walk around in face mask and carry a container of Clorox sanitizing wipes to disinfect anything I touch, and also not feel hurt when people I have talked to pump 20 squirts of sanitizing gel on their hands and rub furiously. So I’m at home, soon to be in bed with a good book. Get a piece of ginger root. Depending on the thickness of the root, use about 1/4 to 1/2 inch slice. Cut away the outside flesh (brown part) to expose the yellow of the inside. Either grate it or mince it with a knife (we mince). As an alternative, cut the brown flesh from the root, and grate what remains using the remainder of the root as a handle. If you don’t mind ginger, you can add the ginger right into your drink, and eat the gratings once your drink is gone, have slightly larger “minced” pieces, and strain it through your teeth, or just put the gratings/mincings (is that a word) into a strainer, and pour the boiling H2O over them. Your choice! ENJOY! PS You may want to get a good book and jump back into bed with the covers pulled up to your chin. As an addition, you may want to add a shot of brandy to the mixture. I like his style. I like the brandy idea, but will wait until evening for that as I’ve just swallowed a bunch of Tylenol Cold Medicine tablets. I’m sitting here with a steaming mug of Ken’s concoction, and it feels like a sweatlodge in my computer room. I can’t speak for the taste of it, because I’m blocked up and have no sense of smell, but somethings a-cooking. I also noticed as I posted his text that he said to use 1/4 to 1/2 slice. I used about two inches worth of ginger root. I’ve got the book, and now I’m piling into bed as instructed. Oh, THAT explains the barking seal I heard this morning in Edmonton! Thanks, thought I was imagining things! I hope you feel better soon. You didn’t imagine anything. I woke up to little fishies tossed up on the balcondy. Even posting when ill!!! 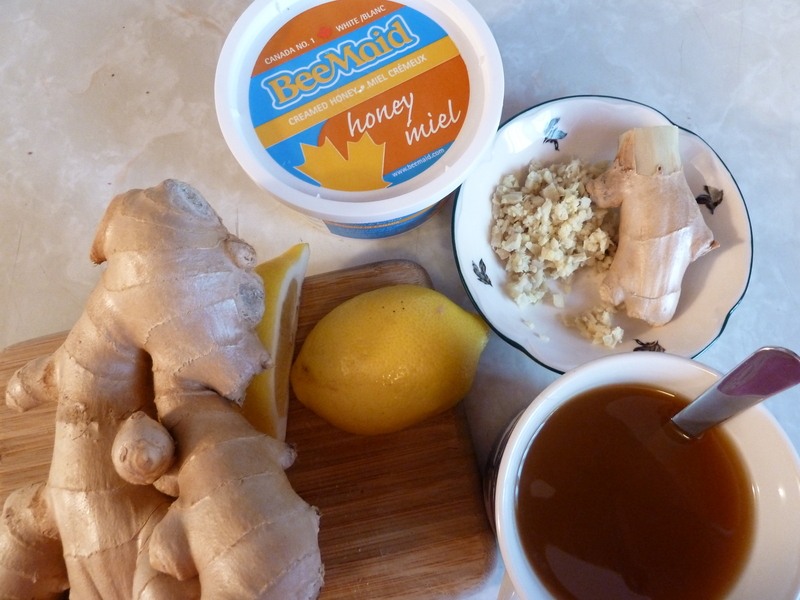 Love these kinds of home brewed remedies! Get well!